“The yearly Līgo celebration happens every summer solstice in Latvia. Complete this sentence about blogging: ”A great blog is…” I think a great blog is one which regularly posts interesting entries, has a central theme, and where there is interaction with other bloggers: replying to comments and pingbacks, and visiting and making meaningful comments on other sites. http://teedeevee.wordpress.com/about/ – Teedeevee’s lovely blog centers around Johannesburg, South Africa. She makes meaningful comments on other sites, and interacts with visitors to her posts as well. http://eof737.wordpress.com/about/ – Elizabeth at Mirth and Motivation has an inspiring blog, and is always generous with her time visiting and commenting on other blogs, as well as interacting with those who visit hers. Thanks, Amy, for inviting me to this circle! * Quote from http://esengasvoice.wordpress.com/2012/10/01/ligo-circle-of-appreciation/ . This entry was posted in Blogging and tagged Blogging Appreciation, Great Blogs, Līgo Circle of Appreciation. Bookmark the permalink. I got it sort of late, too – I think the idea here is to recognize people like you who take time to create great blogs, and also to encourage others… you are always so thoughtful! Congratulations. It is a beautiful and inspiring post! 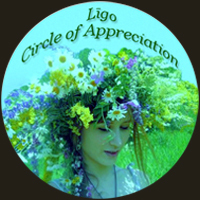 It’ s really lovely to see you becoming a part of the Līgo Circle of Appreciation and helping it grow. Thank you very much!